I first tasted a version of Beef Krokets at one of my local eateries, Hallertau; chef Michael Van de Elzen designed a menu that featured these beautiful fried Dutch pillows, and I've ordered them on every visit since. Now we're here. A lonely, but stunning, piece of brisket has been sitting in my freezer waiting for it's perfect match and these seemed a fitting excuse to use it. I followed a simple braising method to cook the brisket (you can find it here), and then past this point these beauties are very easy to make. 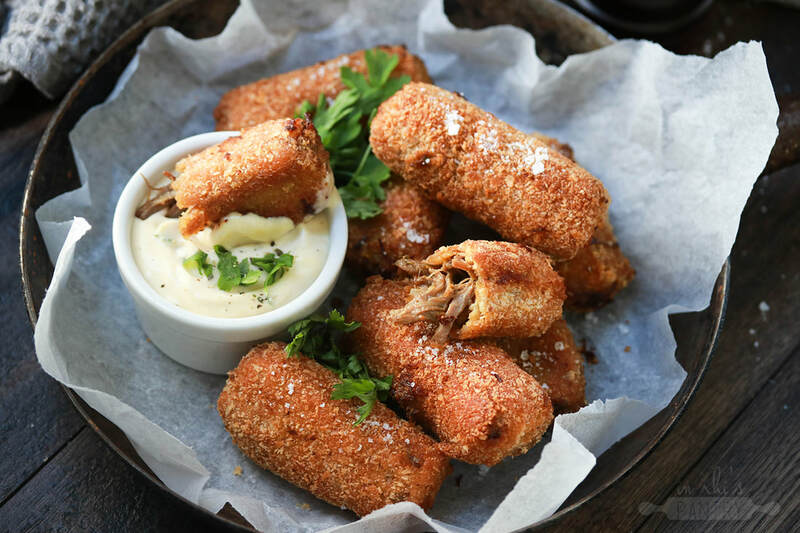 Pulled brisket bound with a rich gravy-like sauce, then double crumbed and fried to golden perfection. Served hot alongside a tangy Dijon & parsley mayonnaise, these are buttery and gone way too fast. Cook the brisket as per method linked above, then shred completely. Mix amongst any remaining cooking liquid and set aside to cool in a bowl. To make the sauce, soften the onion in a pot over a medium heat until translucent. Once cooked, add the butter and stir until melted, then stir in the flour. Cook out the onion & flour mixture for 1-2 minutes, then slowly stir in the beef stock in increments until smooth. Cook while stirring for a remaining 4-5 minutes or until the sauce has thickened to a glue-like consistency. Season and stir through 1tsp Dijon mustard and 1 Tbsp chopped parsley. Pour the sauce over the brisket, and mix until completely combined. Set in the freezer to chill for 30 minutes, stirring regularly. Lay out the flour, eggs and breadcrumbs to crumb the kroket mixture. Place the beef mixture in a piping bag, and squeeze 2 inch logs onto the flour. Carefully roll in the flour, followed by egg and breadcrumbs. Repeat the egg and breadcrumb step then set each kroket aside. Bring your chosen frying oil to a high heat* in a pot, ensuring the oil is at least 2 inches deep. Carefully fry each kroket until they reach a deep golden brown colour on all sides, then transfer to a paper towel lined tray. Keep warm in the oven until all of the krokets have been fried. To make the sauce, stir together the mayonnaise, remaining mustard and parsley. Season to taste with black pepper then serve alongside the hot krokets.